Forbush Corner: Open again at 10am on Friday. XC Ski Headquarters: We received a dusting of snow overnight, and the temps dropped dramatically from the low 30’s yesterday into the teens overnight. As of 6:30am today it continues to snow, and we are forecast to receive 1 to 3 inches throughout today and tonight. Groomer George will snow comb the skating lanes this morning, and as the snow continues to accumulate we may reset tracks later in the day. 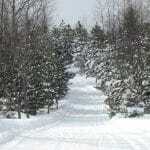 We have a 7 to 8 inch packed base on the trails, and 12 to 14 inches of snow in the woods.